Henoch–Schönlein purpura (HSP) is an acute, self-limited, systemic, small-vessel vasculitis usually seen in otherwise healthy children, but it may develop at any age. HSP is a necrotizing vasculitis, which is an inflammation of blood vessels, mediated by the deposition of immune complexes; it’s a disease of widespread nature and multisystem involvement. The major clinical features are well known, and they include cutaneous purpura, arthritis, abdominal pain, gastrointestinal bleeding and nephritis. We know that nephritis is the one feature of HSP that may have chronic consequences, and the long-term prognosis is heavily dependent on the severity of nephritis. 90% of HSP patients are under 10 years of age. The mean age of patients is approximately 6 years. The disease is present worldwide; no racial predominance has been noted, but African-Americans are rarely affected. HSP is a disorder that typically occurs during the autumn and winter months in children; it usually lasts for 1-4 weeks, although there it can be a great variability in this time frame. The average annual incidence rate of HSP in the population aged 14 years and younger is approximately 135 per million. The proportion of children presenting with renal involvement reported in studies varies from 20 to 100%. In selected series, HSP nephritis leads to chronic kidney disease (CKD) 20 years after the diagnosis in up to 20% of children , whereas this percentage falls to less than 5% in unselected series. The risk of CKD in adults is higher, furthermore they have more often joint symptoms at presentation. Genetic susceptibility. HSP, an immune-mediated vasculitis, may be the result of an immune complex reaction to various antigenic stimuli in susceptible persons. Increased occurrence among family members supports a genetic predisposition for this vasculitis. Increased susceptibility to HSP is found among human leukocyte antigen (HLA)-DRB-01 patients. HLA-DRB-01, however, has not been found to be associated with any specific complication of HSP. Increased susceptibility to nephritis has been observed in HLA-B35 positive patients; this locus seems to independently code for renal complications. Infectious etiology. Although the exact etiology of HSP is unknown, clinical evidence points to an infectious etiology. It is often preceded by an upper respiratory tract infection. In fact, the higher incidence of HSP in childhood, a time at which individuals first encounter many microbes, also points to an infectious component as part of its etiology. A podrome consisting of an upper respiratory tract infection 1-3 weeks prior to the onset of symptoms is found in 90% of cases. In adults, drugs and toxins, including vaccinations, insect bites, and food allergies, may be the primary predisposing factors for HSP. Drug-induced HSP is a common association in adults. The drugs most commonly linked with HSP are angiotensin-converting enzyme (ACE) inhibitors, angiotensin II receptor antagonist (losartan), antibiotics (clarithromycin, vancomycin) and nonsteroidal anti-inflammatory drugs (NSAIDs). IgA deposition. Immunologic evidence indicates that IgA deposition is a key factor in the pathogenesis of HSP. HSP may be initiated by certain microorganisms that share an antigenic determinant with human small-vessel endothelial cells. An example could be cardiolipin, an auto antigen on endothelial cells, because anticardiolipin antibodies have been found to be elevated in children with acute HSP. Following the invasion of a pathogen, antigen-specific antibodies of the IgA subtype cross-react with and are deposited on endothelial cells. However, no specific antigen has been consistently associated with HSP. This may suggest that deposition occurs by a mechanism other than the classical antigen–antibody interaction. One possible mechanism involves altered glycosylation of O-linked oligosaccharides in the hinge region of IgA1. However, the mechanism of the glycosylation defects of IgA1 in patients with HSP remains unclear. The abnormal IgA1 is not fully catabolized in the liver. The decrease in IgA1 clearance results in its deposition in various tissues, such as the renal mesangium. Regardless, once deposited, IgA can activate the complement system via the alternative pathway and cause further damage to the endothelial lining. IgA and C3 deposits are typically found within endothelial cell gaps of the skin and kidney mesangium of patients with HSP. There are many similarities in the immunopathogenesis of HSP and IgA nephropathy. As with IgA nephropathy, serum levels of IgA are high in HSP and there are identical findings on renal biopsy; however, IgA nephropathy has a predilection for young adults while HSP is more predominant among children. Further, IgA nephropathy typically affects the kidneys, while HSP is a systemic disease. HSP involves the skin and connective tissues, scrotum, joints, gastrointestinal tract and kidneys. Inflammatory molecules. Additional factors are associated with the pathogenesis of HSP. Tumor necrosis factor-α (TNF-α), a cytokine produced by macrophages and T cells during an immune response, is found in high levels in tissue and plasma during the acute phase of HSP. TNF-α normally induces the expression of adhesion molecules –as intercellular adhesion molecule (ICAM), vascular cell adhesion molecule (VCAM), E-selectin - on endothelial cells and leukocytes, resulting in the localization of the latter to sites of infection. The endothelial cell-specific antigenic determinants triggered by TNF-α interact with IgA to cause vascular inflammation. Another thing noticed is that the whole blood and urinary levels of Leukotriene B4 were higher, and levels of Lipoxin A4 were lower in HSP patients with nephritis compared with those without nephritis. LTB4 is a potent activator of neutrophils and it induces the chemotaxis of neutrohils. LXA4 inhibits the activation and recruitment of neutrophils and it also inhibits the production of a number of proinflammatory cytokines, including IL-1, IL-6, IL-8 and TNF-α. The mechanism of the abnormalities involving LTB4 and LXA4 in HSP is unclear but the findings may help to explain the prominent role of neutrophils in the pathogenesis of HSP. Moreover, this information may provide new targets for therapeutic intervention. HSP is a syndrome which encompasses nonthrombocytopenic purpura, arthritis, arthralgias, gastrointestinal symptomatology, and nephritis. The predominant cutaneous finding of HSP is painless, palpable purpura. In more than 70% of patients, palpable purpura alone or purpura associated with abdominal and/or joint pain is the first sign. At onset, the eruption appears as crops of erythematous, raised patches, which progress to palpable purple indurations of up to 1 cm in diameter. The first crop is usually found below the waist, with subsequent crops appearing on the extensor aspect of the forearms, cheeks and ears. purpura is directly correlated with patient age. 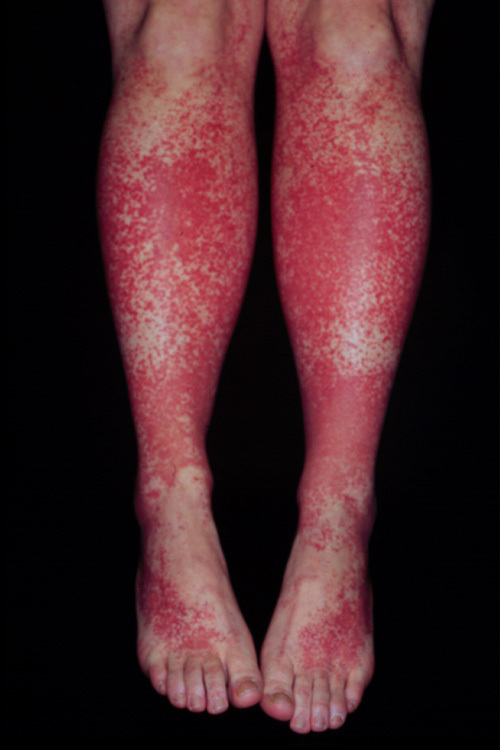 Blisters or hemorrhagic necrotic lesions have been reported to occur in up to 60% of adult patients with HSP. The reasons for the difference in incidence of hemorrhagic necrotic lesions in children and adults are not known. In approximately 20–50% of cases, arthritis or abdominal pain precedes the onset of the purpura. Gastrointestinal involvement, including colicky abdominal pain, vomiting and hematemesis, has been reported to occur in approximately 50–75% of all HSP patients. These symptoms are caused by peritoneal or visceral purpura, leading to the extravasation of blood and interstitial fluid into the intestinal lumen. Abdominal pain is the most common of the gastrointestinal symptoms. HSP begins with arthralgias and/or arthritis as the only initial manifestation in 25% of cases; however, more than 50% of HSP cases involve auricular manifestations. The frequency of joint manifestations is inversely correlated with patient age, with more frequent involvement noted among children. Arthralgia or arthritis typically involves the large joints of the lower extremities, and usually resolves without any permanent deformities. Other features of HSP include low-grade fever, malaise, orchitis, seizures, epistaxis, jejunal hemorrhages, orbital hematomas, central nervous system bleeding and ischemic strokes. Despite these documented cases, HSP in children is usually a mild, acute condition. The course of the illness varies among patients. The individual crops last 5–7 days, although new cutaneous lesions may develop for up to 8 weeks. On average, the disease lasts 2-3 weeks; 15-40% of children have at least one recurrence. A recurrence is defined as the reappearance of symptoms following the resolution of disease for at least 2 weeks. No association exists between the risk of recurrence and the age of the patient. The mean onset of recurrences is 3 months after initial resolution of symptoms. Recurrences are usually limited to cutaneous and gastrointestinal symptomatology. Approximately 20–40% of pediatric HSP patients have renal involvement, a much lower frequency than that seen among adult patients, which is nearly 70%. The significant risk factors for the development of renal involvement in HSP include severe abdominal pain with gastrointestinal bleeding, an age of more than 4 years at onset, and persistent purpura for more than 1 month. Children of less than 2 years of age are less likely to develop renal manifestations. Microscopic hematuria, with or without proteinuria, is the most common renal manifestation. Evidence suggests that the prognosis is correlated with the degree of renal pathology, defined as the presence of tubulointerstitial changes. Although most patients with renal involvement have a good prognosis, some with significant proteinuria may progress to end-stage renal failure. Children may develop rapidly progressive glomerulonephritis. In the pediatric population, factors predictive of a poor prognosis include nephrotic syndrome, nephritic syndrome, altered renal function at presentation, nonselective proteinuria, and hypertension. Approximately 12% of children with HSP will have chronic renal failure 3–4 years after onset. Of those children with HSP nephritis, approximately 20% progress to end-stage renal disease. The risk of progression to renal insufficiency is much higher, approximately 30%, among adult patients. The treatment of HSP is generally symptomatic, relieving associated joint and abdominal pain. In patients with normal kidney function, therapy should focus on the maintenance of hydration, nutrition, and electrolyte balance. Most agree that analgesics and/or nonsteroidal anti-inflammatory agents should be used for the control of joint pain and inflammation in children. In addition, steroids may be used in children with painful cutaneous edema. Cutaneous manifestations are usually self-limited without long-term effects, but may relapse. The prevention of recurrent attacks may be attempted with a period of alternate- day, low-dose prednisolone, or with dapsone. The use of glucocorticoids is controversial and is usually reserved for children with severe systemic manifestations and renal involvement. Long-term use of steroids has many side-effects, including weight gain, moon face, and generalized edema. The role of steroids in preventing nephritis remains unclear. Studies have proven to be inconsistent. Some advocate that immediate treatment with steroids prevents the onset of renal disease. Others report that pretreatment with steroids yields no benefit. The severity of renal disease at the time of presentation is one of the predictive factors for prognosis. Currently, no prospective, randomized, controlled studies exist that clearly define the approach to treatment in patients with significant renal involvement. Parental education and reassurance are the most important therapeutic interventions in children with HSP. Nevertheless, as HSP is a syndrome with a varying clinical spectrum, the approach to treatment depends on the clinical manifestations of the individual patient.